What great news to end 2014, hopefully to be passed by Congress. USA will begin normalisation talks with Cuba following over 50 years of sanctions in trade and diplomatic relations. 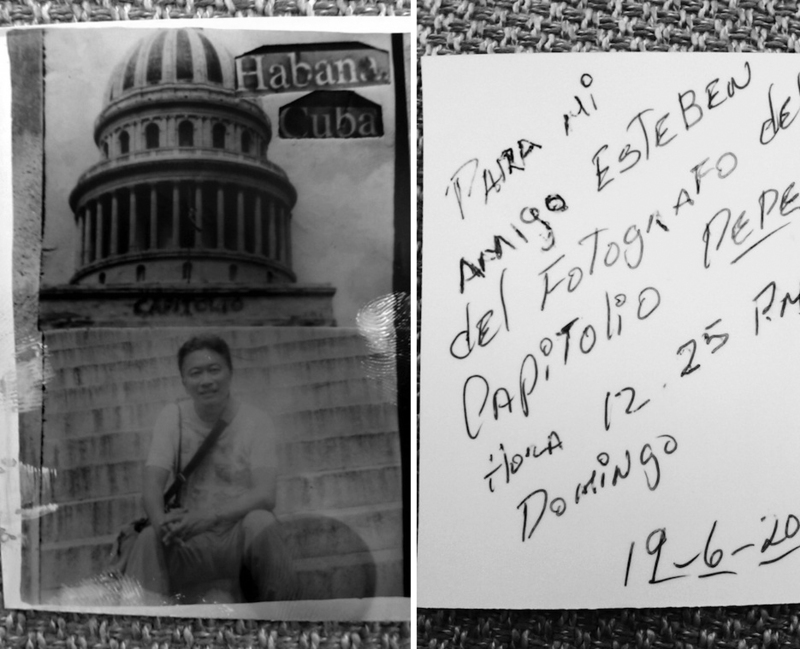 We went there as a photography workshop group in 2011 and found the Cubans to be warm and friendly, open and very resourceful. No doubt there will be inevitable changes should travel restrictions be lifted, on both sides. As 2011 draw to a close, I have trawled through my archive of close to one thousand photographs made over the last 12 months to see if I could identify the most memorable ones, the best ones or the most striking images. Call them keepers, significant images or gems, whatever, these are the 15 photographs that called out to me as I scrolled through the filmstrip in Lightroom. Memorable may not be the best ones, I have discovered. I tend to shoot less nowadays, opting for more precisely captured images rather than a ‘trigger happy’ mode. I guess that’s simply down to time. The less time I have to sit in front of the computer editing and deleting wonky shots, the better. I also shot film this year, albeit about 10 rolls of black and white and experimental colour negs 120 in total with my Rolleiflex. I guess, less is still more. One observation is that I have simply taken more images with my phonecam, some significant images too, as I have the phone with me all the time. However, I have left these out in my quest. I believe this is a good exercise for all you serious photographers out there. 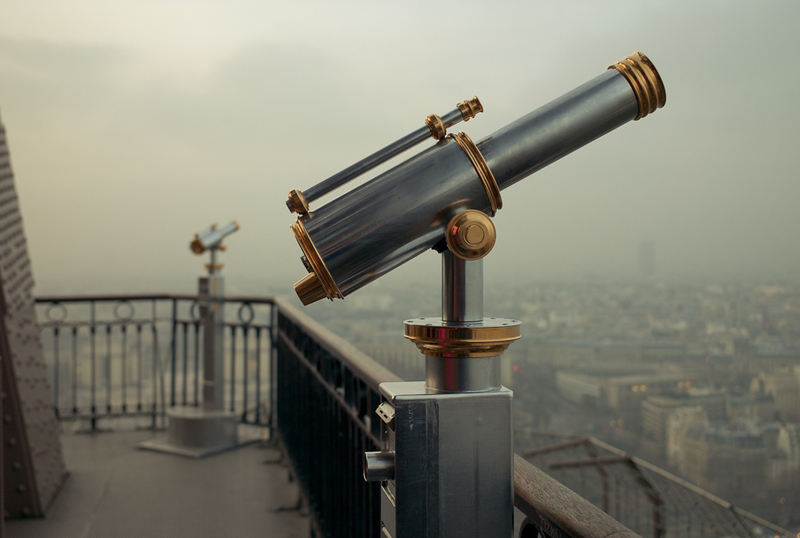 Review your work and chuck out all the clutter, free up some hard disc space along the way also. Honestly, you will probably not be viewing all the hundreds of other images stored away on your computer. Save only the best, your best. Reflect on what you could have taken or been, how you could have improved the shot, changed angle perhaps, zoomed in a little? Used a wider aperture perhaps? Tilt your frame a little? Used a wider lens? Once you are conscious of the variability that you can have in making your pictures, it will open a whole new world. You will be in control. Make a book! With all the online publishing platforms available today like blurb.com or Apple albums, it would be a neat little project to put all your favourite images into a book. The quality is amazing, and you will also have the perfect gift for your friends. That is what I will be doing next year, starting January! Lastly, don’t limit yourself to any subject or genre, shoot everything, who knows, you might even enjoy it! Here’s my Top 15… enjoy! Cheers! I believe Ansel Adams uttered the phrase ‘Twelve significant photographs in any one year is a good crop’. I guess, in his eyes, I have a bumper harvest. 1. R Chubb & Sons Butcher, 350 Upper Richmond Road West, London SW14 – This was taken last December a couple of weeks before Christmas. A friend who buys her meat from this butcher told me about the pre-Christmas turkey orders which her butchers hand pluck to hang, before customers come to collect. Photographed with a 28mm lens inside the shop, I only had a couple of minutes to grab a few shots, most were blurry, and one was a keeper. The lighting was horribly green due to the mix of fluorescent, and daylight plus a UV lamp by the window. 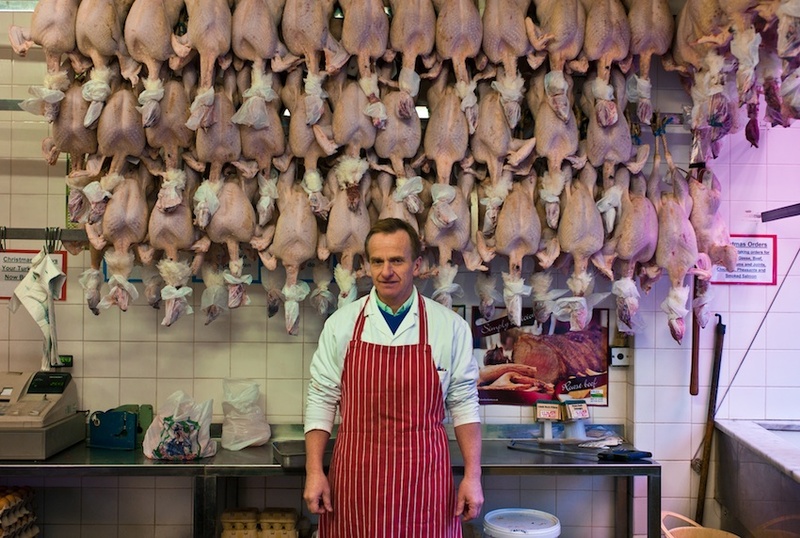 I just love the traditional documentary aspect of this image, the wry smile of the butcher, his sleeves all pulled up, ready for action. These are organically grown birds I suspect, which have been pre-ordered by his discerning customers. 2. 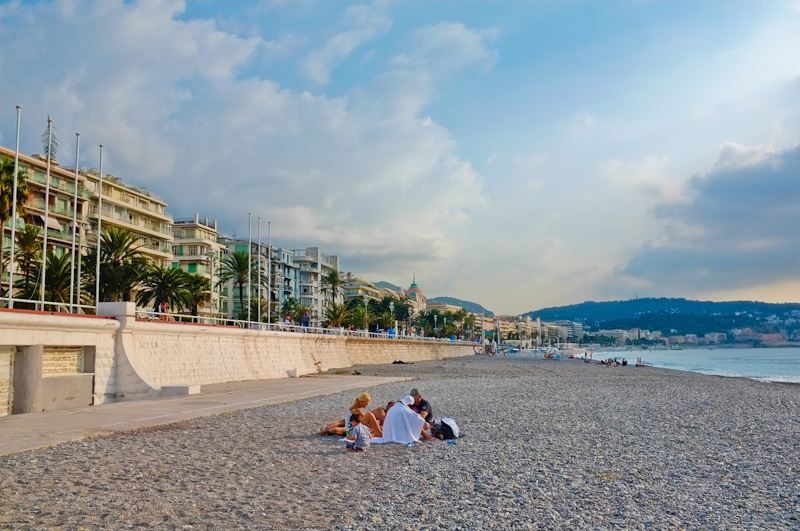 Family at the beach, Nice Plage, France – This was taken in late summer on the Cote d”Azur. This time of the year the beaches are empty, the sea is cold, and the light is simply amazing. It was nice to see a family coming together for a picnic and swim in the icy waters. Not the glamour that you would associate here in high Summer, but ordinary folk having a good time. 3. 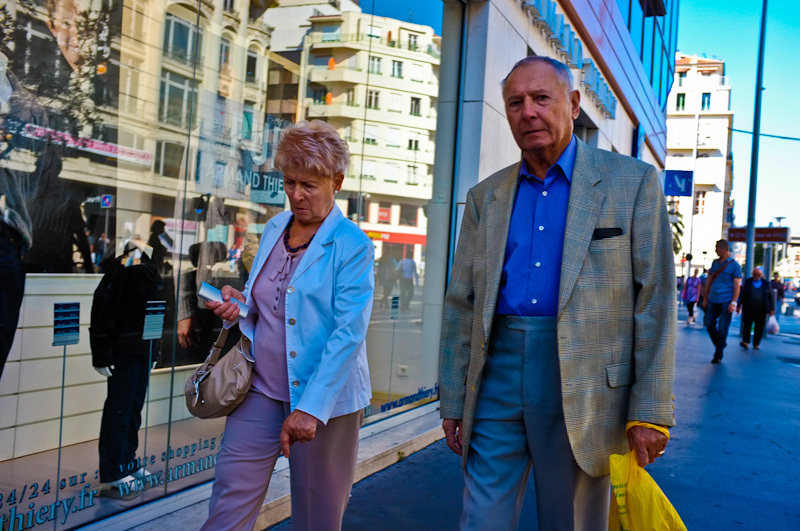 Odd couple, Nice – Also captured in Nice, I find this image reveals the complexity of human emotions, relationships, inner thoughts and the spontaneity which the medium of photography can capture. Deep in thought or idle conversation, the interpretation is left to the viewer to decipher. 4. 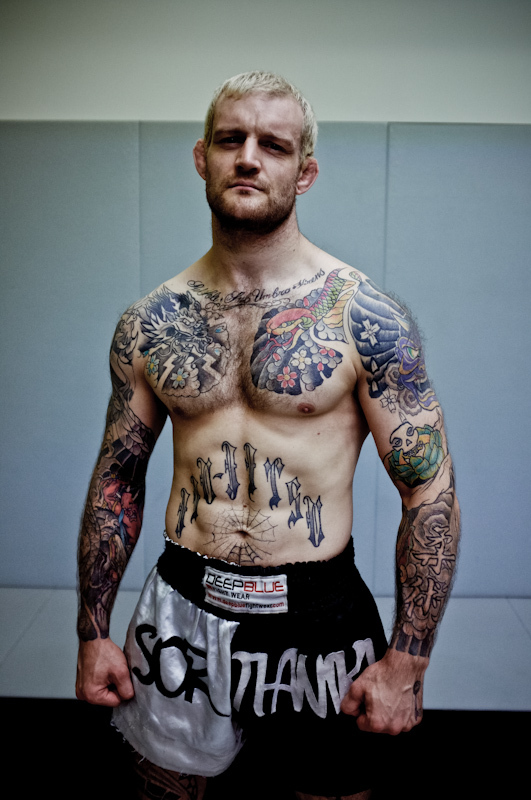 Pete Irving, Urban Kings gym trainer – taken in an ultra modern boxing gym in Kings Cross. The lighting was a challenge, but the camera handled it well. Handheld at 640ISO with the brilliant little Fujifilm X100. 5. Vuvuzela, Notting Hill Carnival, 2011 – I photograph regularly at the carnival in August, and this year I brought out the Rolleiflex and shot some Lomography 120 Redscale film. This was the first time I was using this special film, I was told it was just standard Superia 100 film wound back to front on the spool. It gives interesting red or green tinted negatives depending on the exposure. Give it a stop under and it goes reddish and vice versa, or was it the other way round. I don’t care but the results are nevertheless interesting. 6. 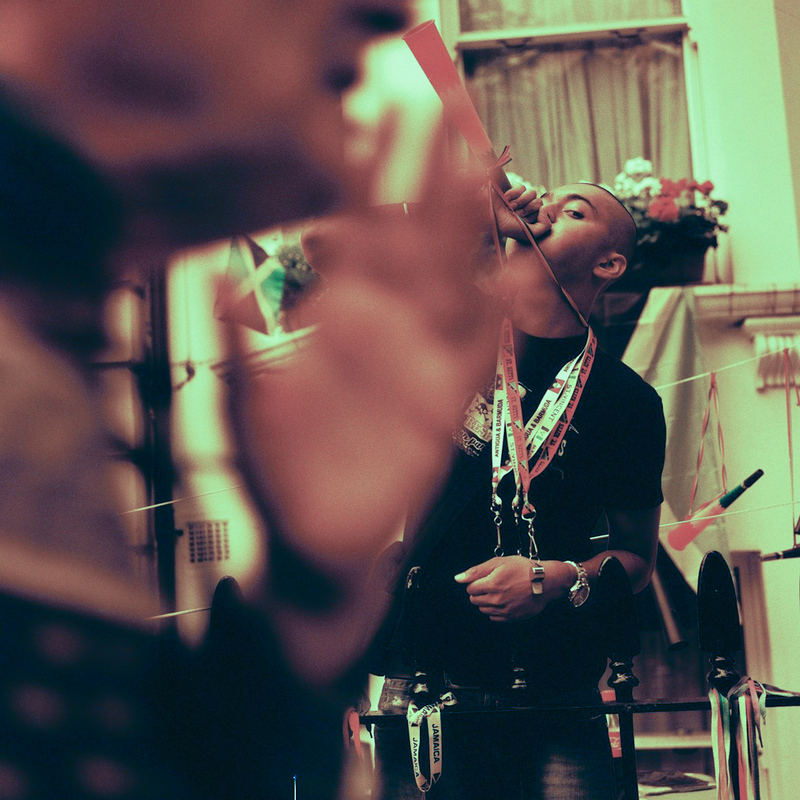 Carnival reveler – I shoot a lot of street photography and urban portraits is one of my favourite subjects. Again, taken with the square Rolleiflex, on Redscale film, I particularly like the blurred background which brings attention to the girl’s cheerful face. Now, what’s wrong with a smiley portrait? 7. 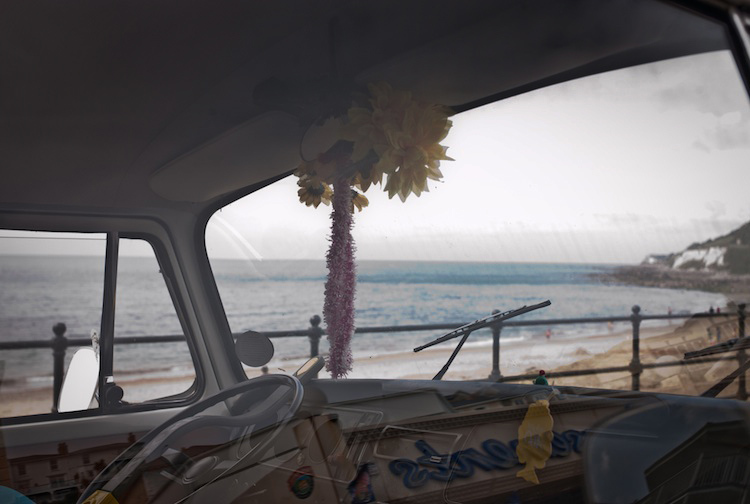 Ventnor Beach, Isle of Wight – We were on the Isle of Wight for a SLOW Photography weekend workshop and encountered this lovely restored VW campervan parked on Ventnor esplanade. Might just enlarge this and hang it on my wall. 8. 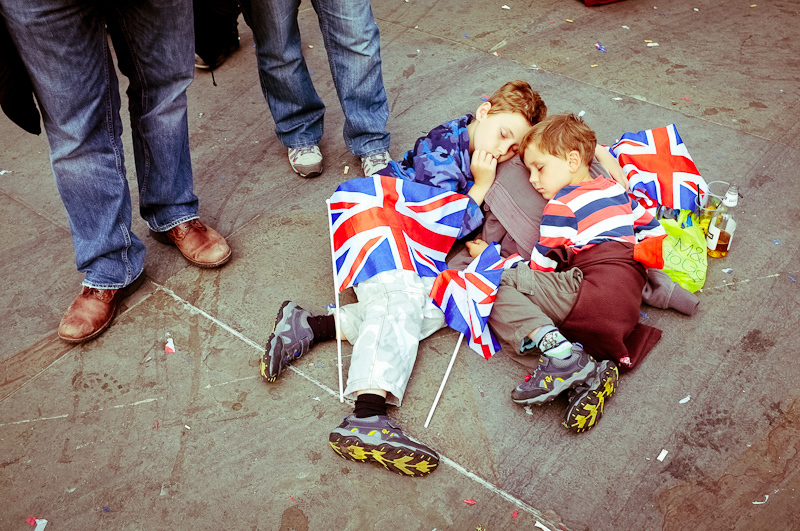 The Royal Wedding, Trafalgar Square – This picture of two brothers sleeping on the ground at Trafalgar Square was simply too good to miss. There had only just been a Royal Wedding, and a huge crowd gathered there to watch the live telecast on giant LCD screens. Tired out or just not interested, they slept peacefully whilst their parents stood over them. 9. 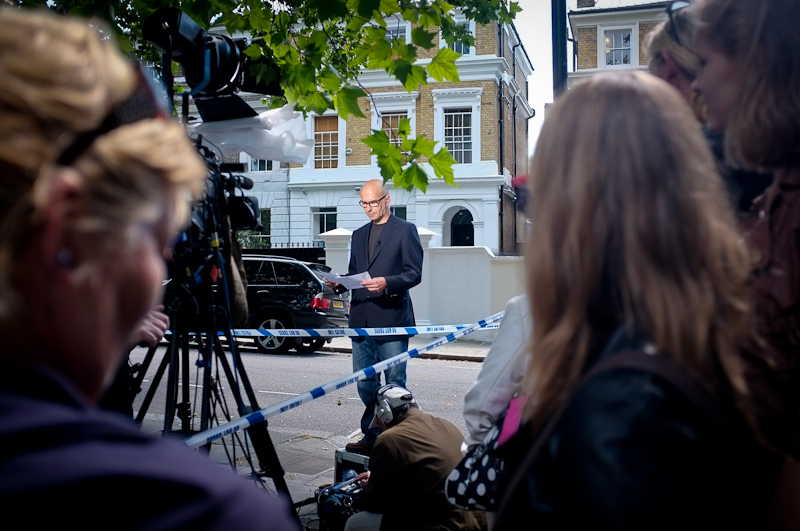 Outside 30 Camden Square, London NW1 – Simon McGregor-Wood, anchor of ABC News making a live broadcast outside Amy Winehouse’s home, the day after her sudden death. 10. Second Floor, Eiffel Tower, Paris – Not quite sure why this photograph was screaming out to me, but then it always a special moment to be at the Eiffel Tower and the light was kinda surreal too. Definitely a hanger. 11. 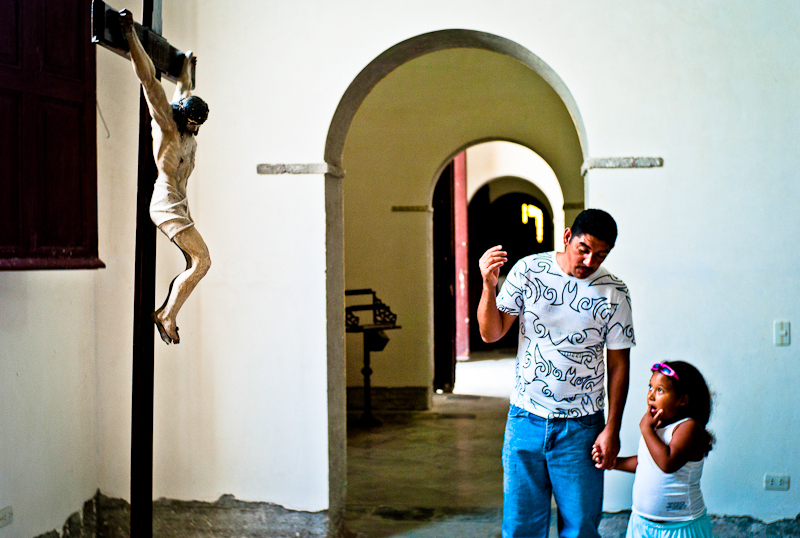 Havana, Cuba – Taken in the Cathedral in Central Havana. A tender moment in this photograph of a father explaining the depiction of the Crucifixion to his daughter. A grab shot in all ways, I was there at the right moment. I think I fired off 4 shots but only one was sharp. The first one. Lesson learnt. 12. 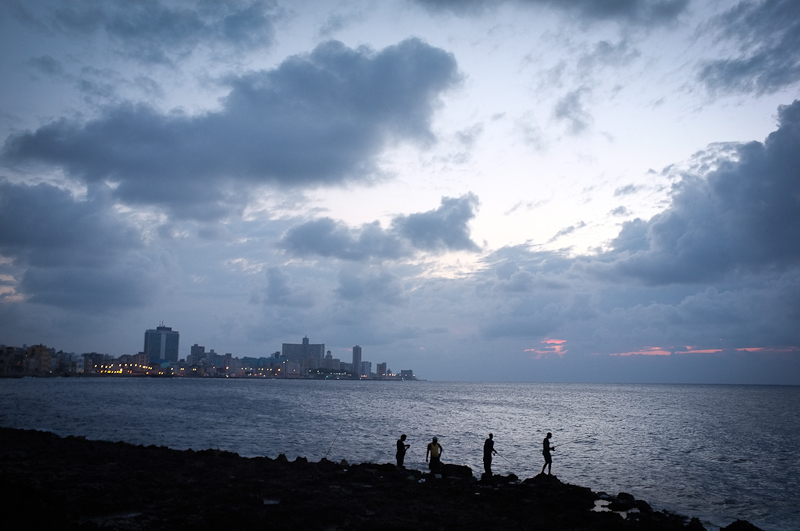 Malecon, Havana, Cuba – Cuba was the destination of one of our photo workshops. The Malecon is a famous stretch of seafront lining the north coast of the city of Havana with the Florida sea. Just some 90 odd miles away is Florida, where so many Cubans risk their lives to cross over by boat. This photograph was taken in the early evening, where we were walking to our dinner appointment. Four boys fishing in the foreground show the scale of this stretch of coast. 13. Visiting Che, Santa Clara, Cuba – Che Guevara’s monument in Santa Clara is an amazingly stoic place, sparse, all marble and concrete. A group of local women walk past the huge statue of their favorite national hero. 14. 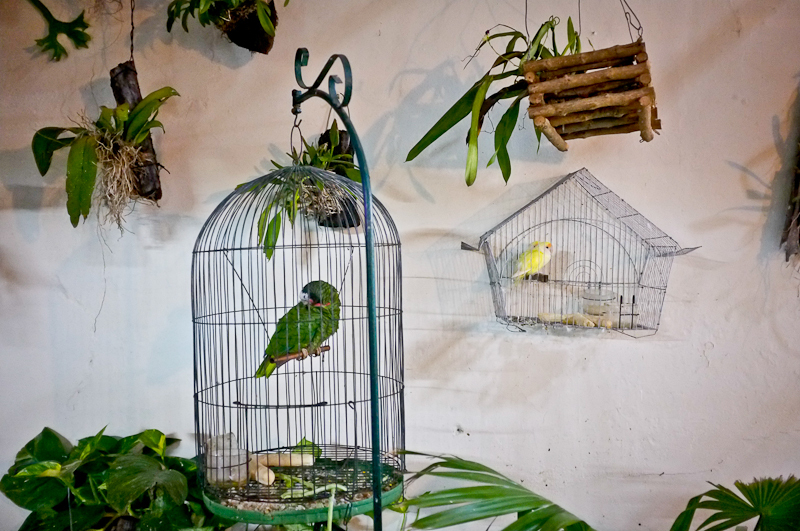 Havana, Cuba – A popular pastime for Cubans is to rear birds. I found this interesting wall complete with growing orchids and tropical plants in the rear courtyard of a restaurant where the Buena Vista Social club members were performing. The light was very low, and it was a gamble to take the shot, at 1600ISO. 15. 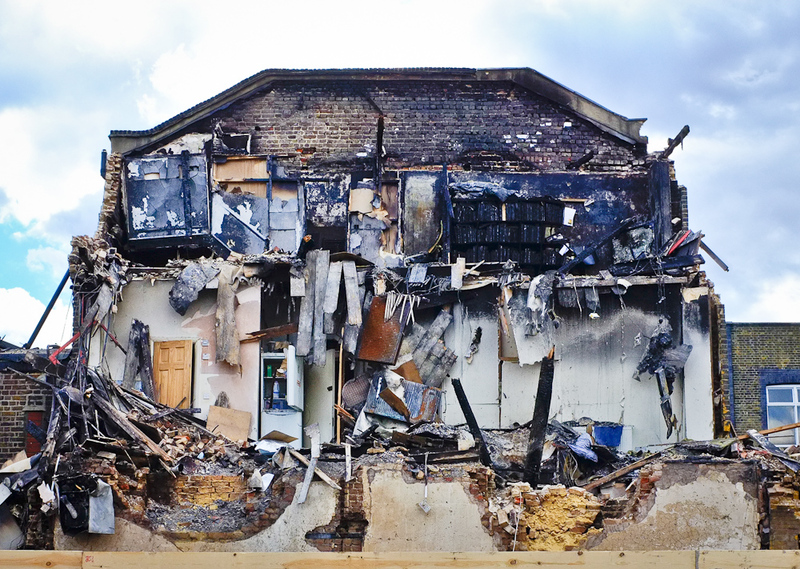 Tottenham, one week after – A significant photograph of a burnt out building, totally destroyed by fire at Ground Zero of the Tottenham riots in August. The trouble in Tottenham sparked a nationwide riot, the worst in UK history, causing millions of pounds of damage and widespread looting, violence and deaths. NB. Any of these pictures are available to purchase, just send me an email for a quote. This is the first time I’m compiling this, may make it a regular yearly ritual. No photography trip to Cuba would be complete unless there are some photographs of old American cars, one of the main attractions of Havana. Chevys, Fords, Lincolns, Cadillacs and various other forms still continue to roam the streets despite some of these machines having gone way past their sell-by dates. We came across some fully restored fine examples of these 50’s glories, and also some really clapped out ones. Most, if not all have had their innards replaced by more modern Japanese or Chinese truck engines and their attraction aren’t to be missed. 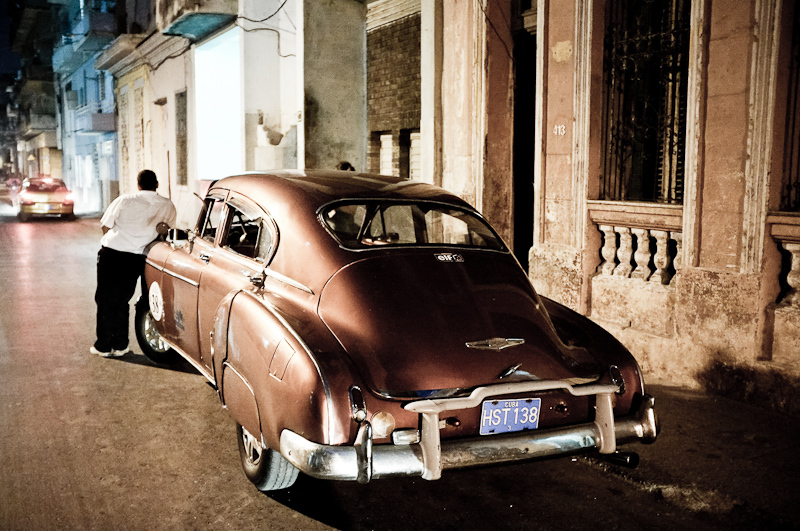 Mainly used as taxis to ferry locals, some carry tourists for sight seeing trips around Havana. Kinda cliché to photograph, but not unlike visitors grabbing shots of black cabs and red phone boxes in London. Here are some casual snaps of these Yank Tanks. I just love their bright colours amongst a back drop of crumbling earthy buildings. Andy decided to tint a series of portraits in selenium to create a moody and enigmatic feel for his ‘Cubanos’ subjects to avoid being derivative. He photographed mainly with a 80mm F1.2 Nikkor AI manual lens on his D3 body, providing incredible small depth of field, which is his signature style. 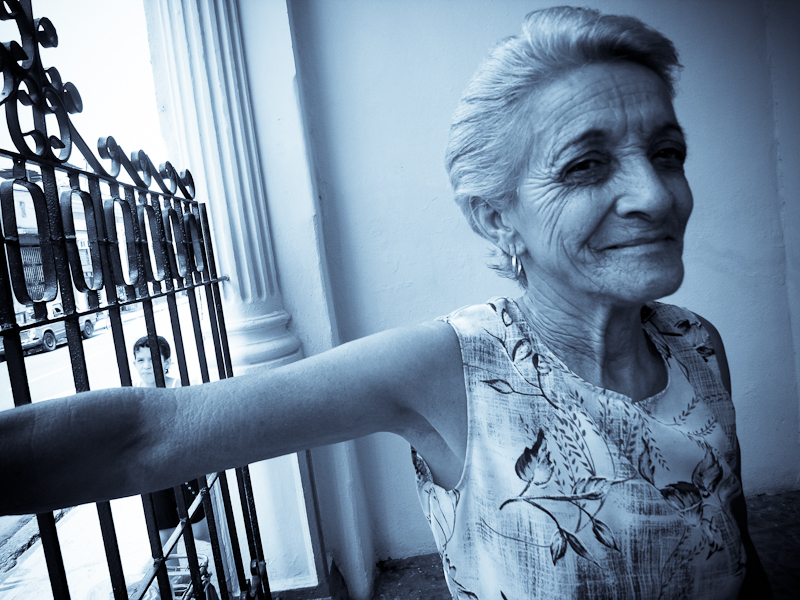 These intimate portraits were made on the streets and alleys of Havana, Trinidad, and Cienfuegos. I had my portrait taken…by a 111 year old box camera! 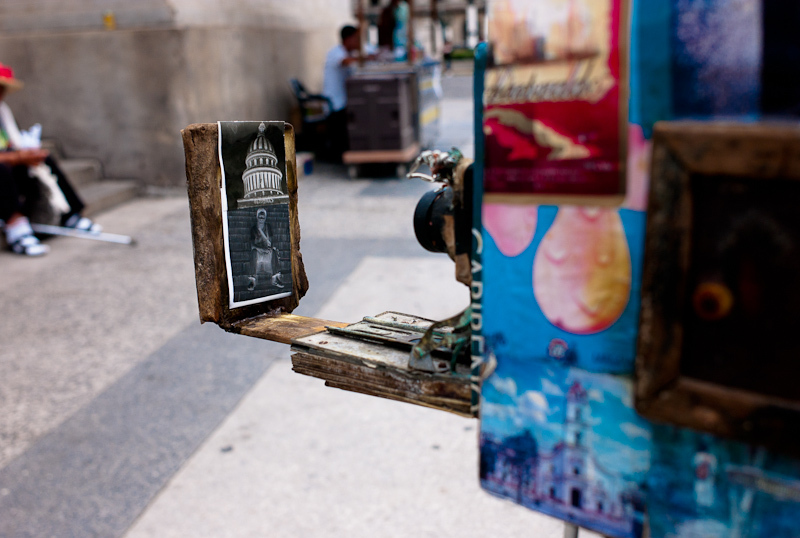 On the last Sunday before our group left Havana, I met Pepe on the steps of Capitolio, the state building in Central Havana. 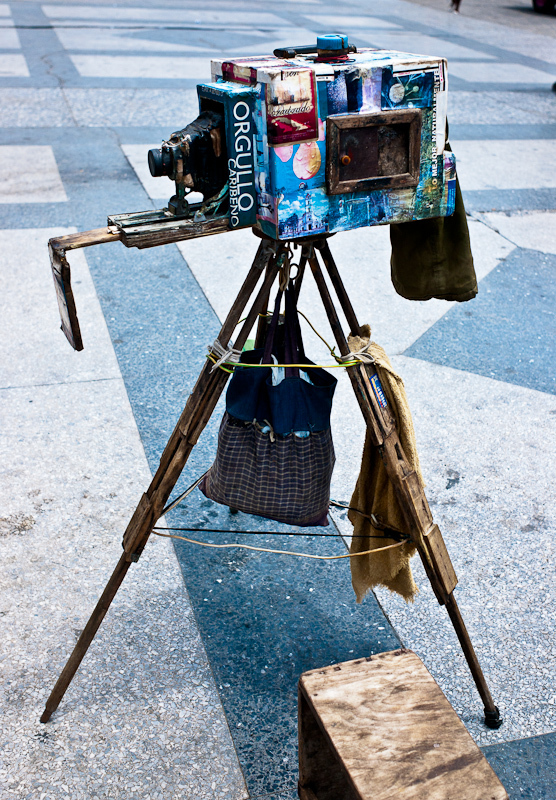 I was intrigued by the contraption of a camera he was fiddling with, basically, a large box, covered by pieces of paper torn from magazines, on a wooden tripod. A quick smile and a “Ola, and we chatted in English. I discovered he was operating his grandfather’s 111 year old camera obscura, or box camera, ..and…he can take a photo with it, and produce a pretty instant print for me in less than 5 minutes..slightly wet print, mind you, but a REAL silver gelatin print and not a Polaroid! He went on to show me how he can process the paper inside the box after he had exposed the paper by opening the ‘shutter’, a plastic bottle cap for 1 second from the cheap scratched lens at the front. You see, there are two small shallow trays inside the box, which processes and washes the print, then he slides open the tray from the back of the camera, and continues to fix it in another tray! Finally he dunks the print (still a negative image) into a bucket of water to rinse it. That’s not all! Because the first image is a negative print, he then proceeds to re-photograph this print by placing it onto a bracket in front of the lens. Suddenly, his portrait lens converts into a macro-focusing one. Pepe then adds some ‘old trickery’ to the print by sticking a fake Capitolio dome above the portrait, sticks some reversed “Cuba” and “Havana” letters and voila! 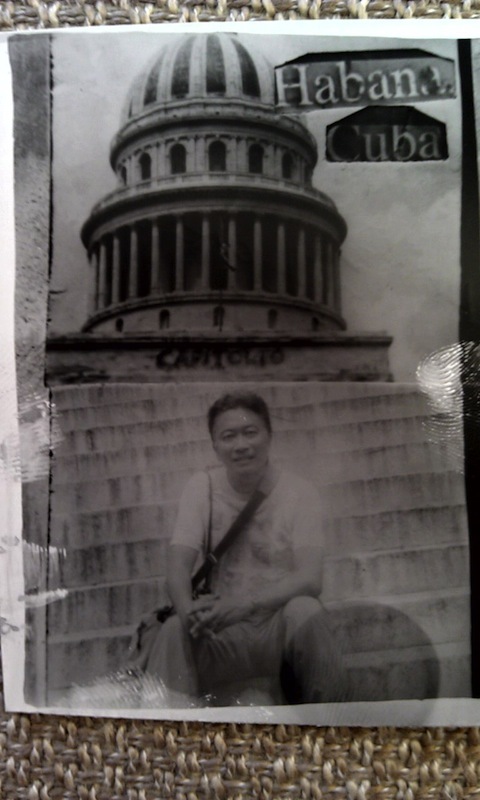 (He calls this Photoshop) A perfect portrait of me sitting in front of the Capitolio is completed. Another few minutes pass by, and he is busy processing the final ‘positive’ print inside the camera and hands it to me still wet. All the show for 2 CUCs! Simply amazing stuff. 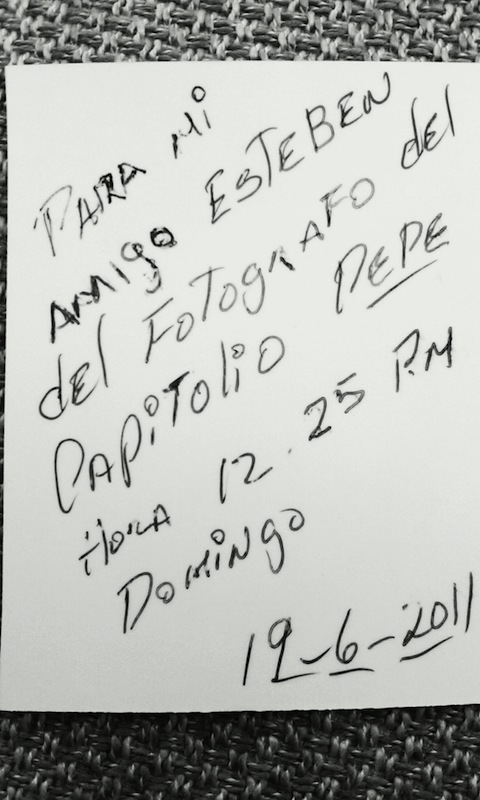 I got Pepe to do our group photo after that. 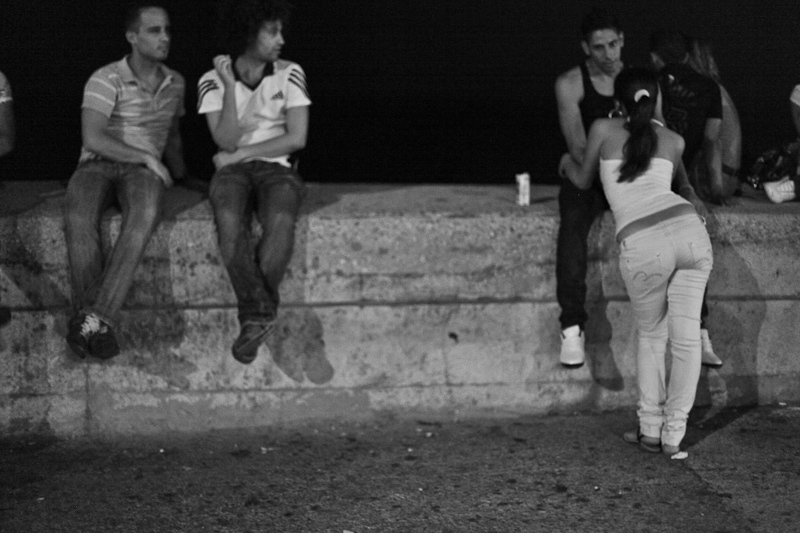 The fourth instalment in the Malecon series comes from Bruno Couck. 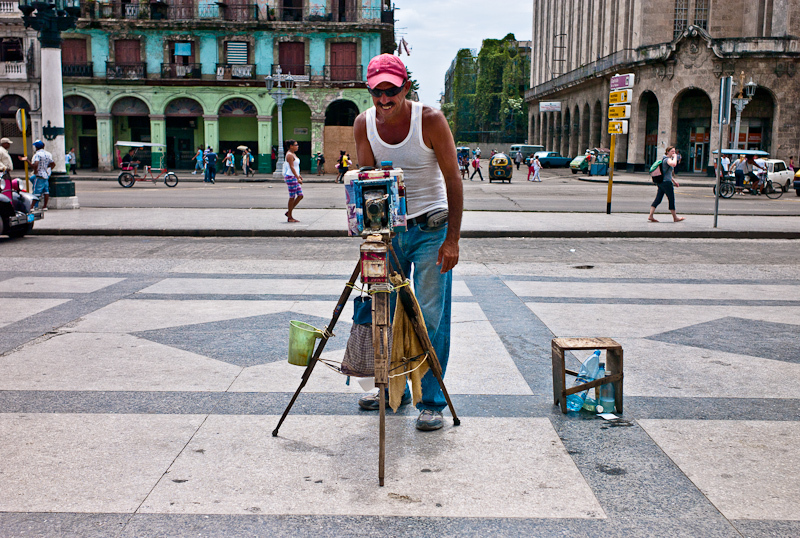 Bruno typically photographs architecture and abstracts, and is beginning to enjoy street portraits and close quarter photography in a new light in the streets of Havana. The Malecon intrigued me somewhat, after seeing many photographs by well-known photographers in the past, and now that I was finally arriving on this ‘hallowed’ stretch of concrete I was excitedly keen to make some images that, for a first visit, meant something greater for me than mere snaps. 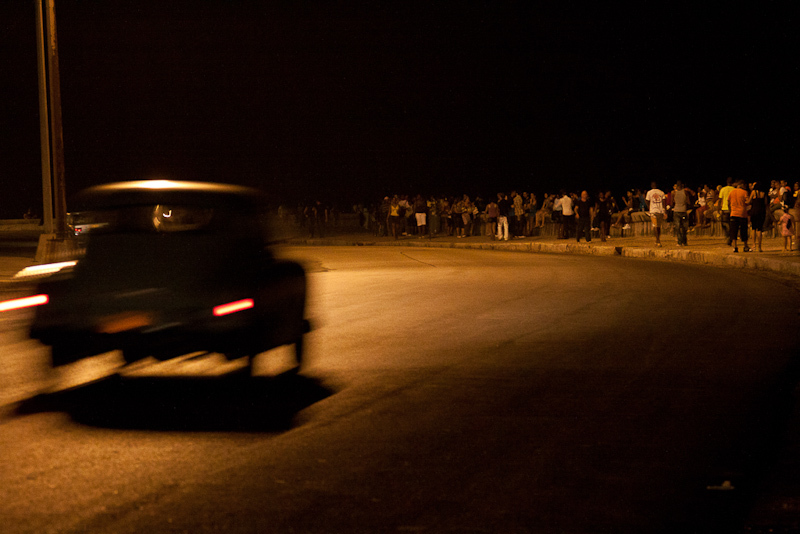 It was during a drive-by the previous Saturday evening in a Cubataxi, one of the yellow Lada-state taxis, that I noticed the amazing night scenes along the seawall, with literally thousands of Cubanos mingling, chatting and perching on the walls late at night. I saw young teens, older locals, families with their kids, people swigging and sipping rum from bottles, playing guitars, stalls selling snacks and of course the ever watchful Havana policemen and women, who do such a great job in keeping the peace, thus there are hardly any reported thefts, robberies or crime. 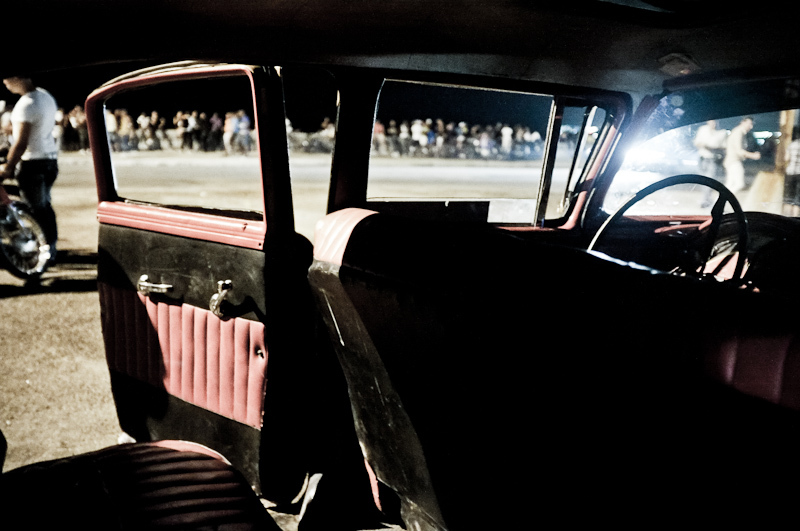 This Saturday night, we cruised the Malecon in a clapped out faded pink 1950’s Ford. Our driver, a huge beefcake of a man, found a convenient spot to drop us off as we promised to return in 30 minutes or face long walk back to the hotel. The 6 of us headed off and along the Malecon, split up into ones and twos shooting our own series. I shot with a compact Fujifilm X100, which I had been using practically the entire trip, with the ISO cranked up to 400 and using the built-in flash. I also shot stealthily in available light at ISO3600 in a few instances, when I needed to preserve the moment. 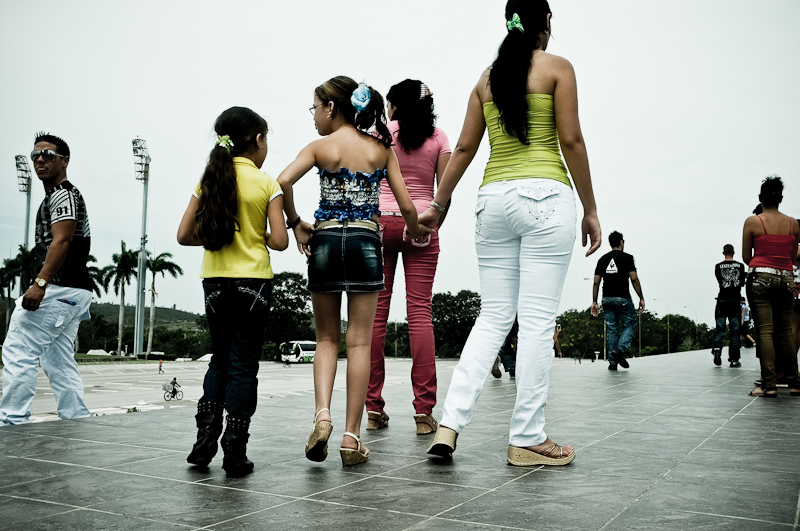 Another take of the Malecon series by Keng Fun Loh sees a totally different and rather voyeuristic approach. Fun simply decided to shoot in available light (which in some parts wasn’t available at all!) composing a shot every 6 paces along, at a fixed distance away from the sea wall, with a 50mm lens, and making full use of the Canon 5DM2’s high ISO capability of 6,400. Focusing was pretty touch and go in complete darkness whilst, some frames were lit by the headlights from passing cars. These photographs capture the honesty of the moment, candid and unobtrusively depicting the locals hanging out, unperturbed by a sniping visitor. The Habaneros love the Malecon, which is an 8km walkway, promenade, esplanade, seawall (call it what you want) on Havana Bay, stretching from Old Havana and its rickety port, along New Havana with its belle-epoque buildings, and 60’s style iconic beach hotels right up to the Vedado area, where souless Russian-style construction is evident. 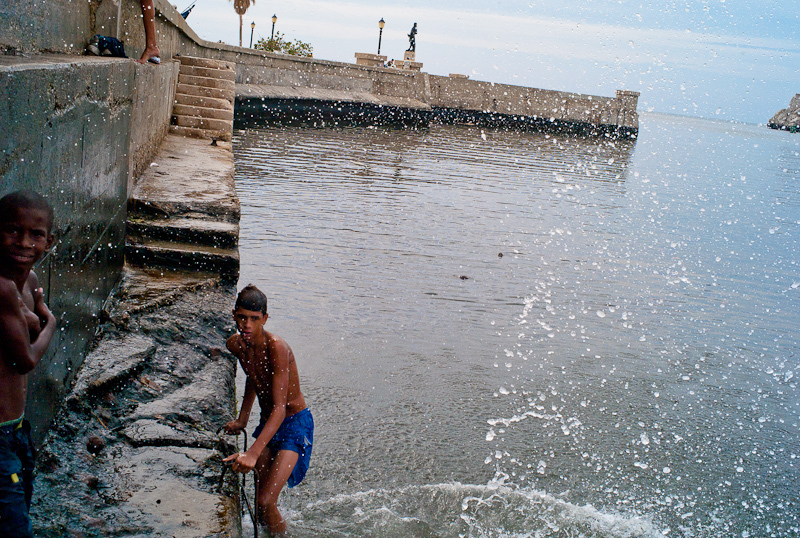 There is no stretch of concrete in Havana, or perhaps, Cuba better than the Malecon, for the young and old of the city to relax, chill, hang out, fish, dive, and make-out. We were fortunate enough to pop along after our last Saturday evening farewell meal at the famous La Guarida (which is another story) to meet and photograph the locals and tourists doing what they do on the Malecon. Here are a series of images from the group (starting with Ivy Tan) showing how different interpretations of the same shoot can result in equally spectacular photographs. Ivy’s approach to photographing the divers was more specific and focused. She only had a limited time to make these pictures on the Saturday, having just returned on a 6 hour bus ride from the the coast, whilst the rest of the group were either exhausted by the 33C heat, or busy buying cigars. Nonetheless, what she achieved was a tight and close-up view of these hunky boy divers doing their thing. Her naturally amicable approach to people is an asset she uses to get real close to her subjects. Shooting with a compact Leica also helps in this case, where the looming silhouette of a typical DSLR-toting tourist is lessened.